Disney Interactive announced today the release of Story, a digital storytelling app for iOS devices. Although targeted primarily to parents and families, this app allows anyone to capture photos and videos of any moment and assemble it into a nice collage that can be shared privately and on Facebook. 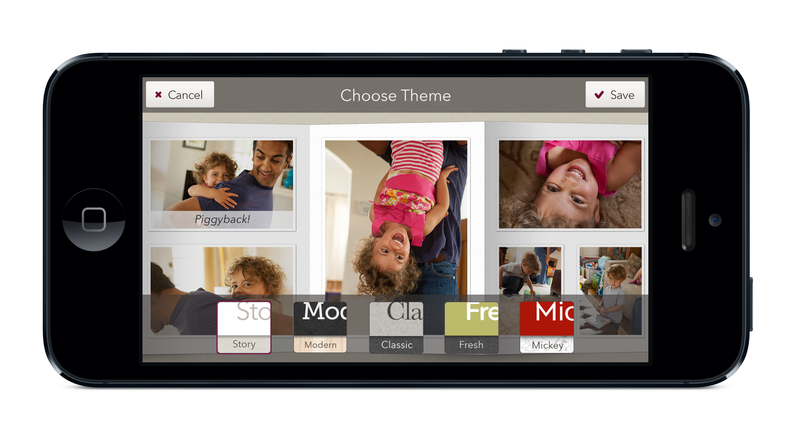 Brook Chaffin, Disney Interactive Family’s Senior Vice President, says that “When we become moms, our iPhone instantly becomes the go-to device to capture the spontaneous moments of family life. Before we know it, we have thousands of photos and videos on it.” Story looks to capitalize on that leveraging geo-location and time to properly indicate what is considered a “moment”. Story’s background isn’t anything new for the industry as others have tried something similar, such as Flock. However, Disney offers two main differences: its app is based on individuals, not groups, and also assembles an album to reflect on the day’s events using in an aesthetically-appealing design. 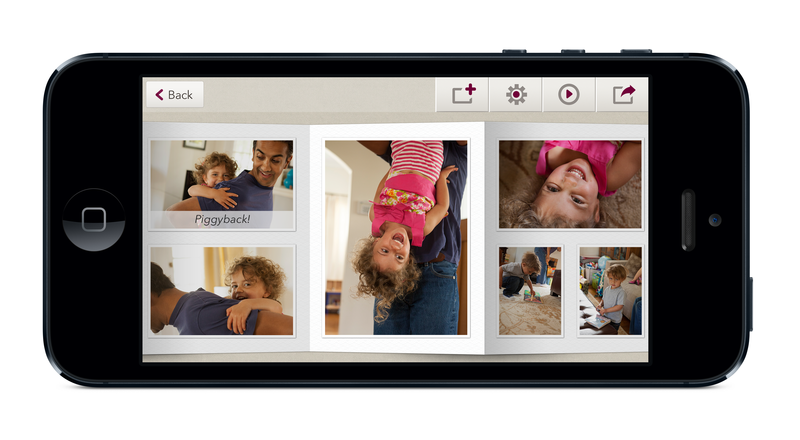 Story scans the iOS device’s camera roll and returns to you potentially significant moments that spans a day. Each one has already been stylized as a story that can be shared immediately and can be customized and personalized to the user’s needs. Scott Gerlach, Disney’s Director of Engineering, says that moments are relatively small, bite-size, and shareable because Disney wants people to share them and create more. Each one can contain up to 20 images and two videos (up to 1 minute in length). Moments can be shared on Facebook and by email. Because Disney is still about parents and mothers, Story was built with them in mind — Gerlach says that having content shared to Facebook or by email is logical because of the audience’s sharing behavior. When a moment about a child or family activity is captured, pushing it out to a much more open and public setting like Twitter or anywhere else might seem daunting and unwanted for some parent. With Facebook, parents could share their photos in a setting where they know their friends can mostly see it. However, conscious that other audiences will use it besides parents and mothers, Disney says that it will eventually look at other services like Twitter, Pinterest, and Google+. While moments are assembled automatically by Story, users can choose to create their own manually. Once the right media has been selected, they can be assembled into one of four layouts, almost like compiling a magazine. 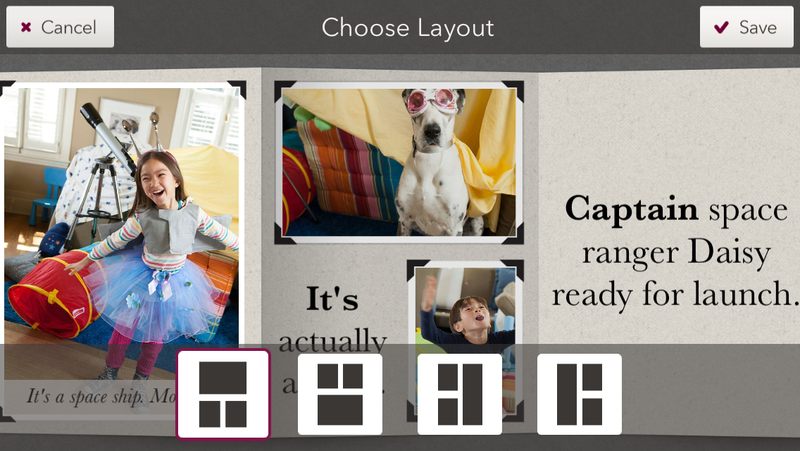 Text can be added to each Story making it more personalized. Think about it like a digital scrapbook of that day at a Disney theme park or on a camping trip to Yosemite National Park, or maybe the day you spent in Venice, Italy. Being able to include more content besides photos will help make it more meaningful. Story also provides themes that users can choose from. Initially there are five to begin with, although Disney does plan on adding more. 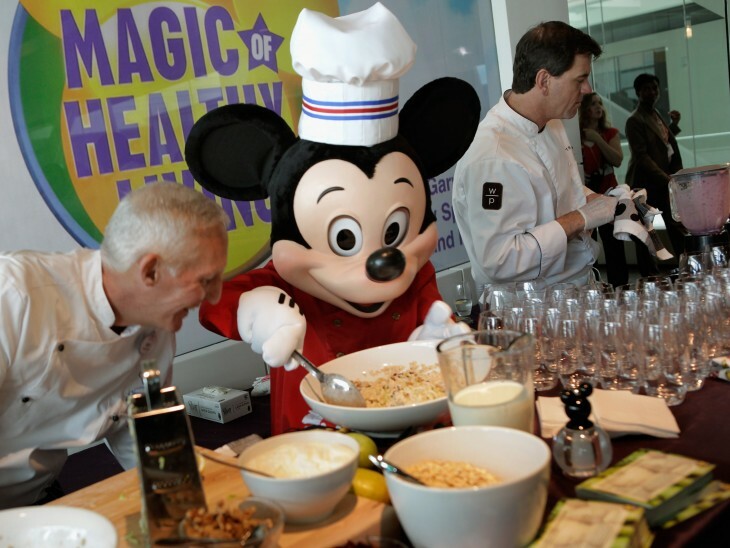 The company even brought in a Mickey Mouse theme that people can have fun with — and no, there aren’t any hidden Mickey ears. Once assembled, the story can be shared with anyone the user chooses. A Web link is provided and family members and friends can view it right from their browser. Because of its concern for privacy, Disney has made the shared Web addresses very generic so that way it’s difficult to find the user’s other moments. Just like Instagram back in its early days, Story also does not have any user profiles as well. Stories can be navigated manually or can be set to auto-play that will stream the moment in one smooth motion. Disney tells us that some content will be moderated, including videos, which are checked for copyright infringement when it is initially uploaded. If there are stories that are deemed to be inappropriate according to Disney’s Terms of Service, either the entire moment can be removed or specific parts. However, it is not actively patrolling user content, but instead relying on users to report anything inappropriate. Right now, no ads will be shown in the app or adjacent to the content. However, Disney does say that it may include sponsored galleries in the future, meaning that if one of its partners has a story that “fits with the Story ethos”, it could be included. And no, Story does not have any filters for your images. Disney says that it will also be leveraging the app throughout the company and into its various properties. The company says that the Disney Interactive Family blogger network will most likely be using Story to share personal stories with their readers. It will also be touted at Disney Resorts — what other way is there to share moments from “The Happiest Place on Earth”? Additionally, the app is said to be cross-promoted in existing Disney Mobile apps and on television. Story is available now for free in the Apple App store.